Traditional Greek “Μoussaka” with aubergines and courgettes, juicy cinnamon spiced mince sauce topped with a crunchy parmesan crust on rich béchamel sauce. This version of moussaka is the lightest and tastiest you can get! Part 1 Prepare the meat by softening the onions in water and adding the garlic. Once the onions are softened, in high temperature and with an open lid, add the mince and cook until dry. Add the tomato, the tomato paste and spices, turning the fire down and opening the lid until the mince is dry once more. Finally, after adding the oil, remove the uncut garlic cloves (to keep the dish light) and taste it. When cooked, the mince should be neither too dry nor too watery (since the dish will be too soggy). Leave the mince aside for later use. Part 2 Preheat the oven at 220°C. First, wash the vegetables well, cut them in ½ cm slices and lay them on parchment paper in two separate trays. Using a brush, spread olive oil on their upper side and sprinkle salt and pepper. Place them in the oven (both top and bottom heating elements) and bake for 40-50 mins until the vegetables become soft and golden. During this time, turn them over. Part 3 While the vegetables are baking, prepare the béchamel sauce, which has to be tight and not watery, so it holds at the top layer of the moussaka. In a medium saucepan, heat the butter over medium-low heat until melted. Add the flour and stir until smooth. Meanwhile, heat the milk in a separate pan until just about to boil. Add the hot milk to the butter mixture little by little, whisking continuously until very smooth. Bring to a boil then remove from heat. Season with salt and nutmeg, and set aside until ready to use. Part 4 Now it’s time to bring all the pieces together! In a glass tray, first place the vegetables, then the mince and finally spread the béchamel evenly on top. Sprinkle with grated parmesan and rusk on top. Bake the moussaka at 190°C in a preheated oven for 45 mins until golden. When ready, remove it from the oven and leave to cool for about an hour prior to serving. This prevents the moussaka from breaking up when served. 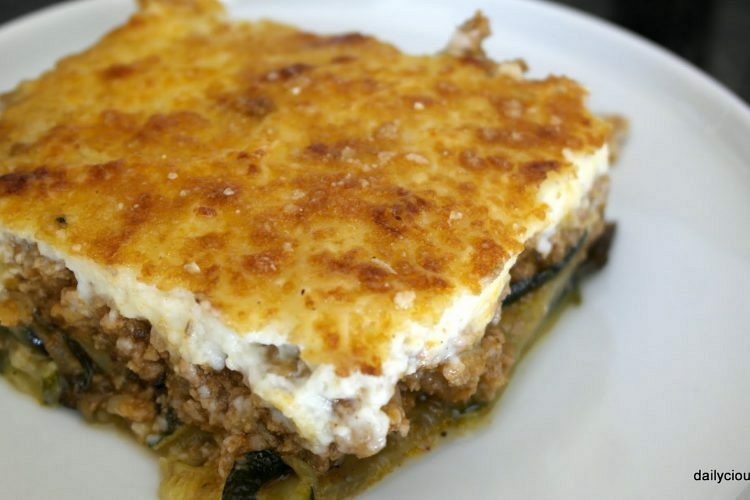 Enjoy your authentic greek moussaka!